B.C. 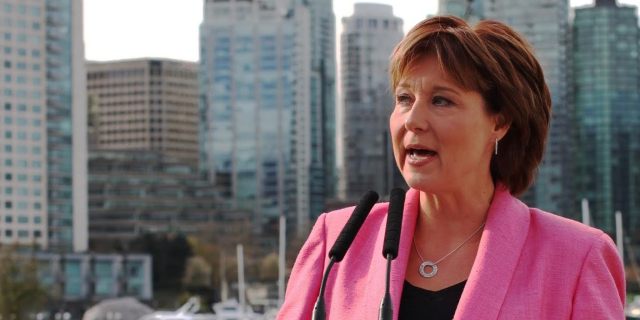 Premier Christy Clark says she is pleased by the dramatic impact her tax on foreign buyers is having on Metro Vancouver's residential real estate market. According to data released by the B.C. government today, billions of dollars in Metro Vancouver real estate deals dried up virtually overnight after Clark introduced a 15 per cent tax on foreign nationals last month. "I think it is fair to say we have had an impact. That was the impact we wanted to have," said Clark on Thursday morning in Kelowna. The number of transactions involving foreign buyers plunged, from 2,034 deals in the seven-week period before the tax, to 60 in the four weeks starting Aug. 2. "My hope is that many of those units that would have sold to foreign buyers, will now be sold to British Columbians," said Clark. According to the data, in the seven weeks before the tax was introduced (June 10 to Aug. 1) the total value of all residential sales involving foreign nationals was $2.3 billion — an average of $329 million per week. After the tax was introduced, the value of sales over a four-week period (Aug. 2 to 30) plunged to $46.9 million — an average of $11.8 million per week. The percentage value of sales involving foreigners also fell from 16.5 per cent of all sales to 0.7 per cent in the month after the introduction of the new tax, the latest numbers also revealed. The numbers also revealed a huge spike in sales on the final business day before the tax was implemented. "On July 29, 2016, more than $850 million in residential property transactions involving foreign nationals in Metro Vancouver was registered at the Land Title Office," said a statement released by the government. That is equal to more than 55 per cent of all transactions registered in Metro Vancouver on that day and almost 40 per cent of the total foreign investment in Metro Vancouver residential real estate for the entire period after data collection began and before the additional tax took effect (June 10 to Aug. 1). "Lots of people moved their transactions into July from August because they wanted to avoid paying the tax, so I think we will start to see those number change in the coming months," said Clark. "It is really early days. We have three months of data. You'll see those numbers change. " But NDP housing critic David Eby was also quick to react to the news, saying he believes foreign investors are already finding ways to get around the tax. "It is important to recognize that this is just a fraction of the money in the international housing market," said Eby. "People are assigning deals to friends and relatives who are Canadian citizens or permanent residents." The province introduced the tax with the goal of reducing speculation by foreign investors and to cool the city's red hot real estate market. The new rules apply to home purchases in Metro Vancouver, excluding the treaty lands of the Tsawwassen First Nation. But already, a class-action lawsuit has been filed in B.C. Supreme Court on behalf of virtually all non-Canadians who have been forced to pay the tax. When asked about the lawsuit on Thursday Clark said she was not concerned. "Government can't do anything in the modern day without somebody launching a lawsuit ... but I knew what we did was the right thing. and I am prepared to go to court to defend that decision." The data announced Thursday was collected using a new rule introduced on June 10 that requires buyers to disclose whether or not they are Canadian citizens or permanent residents when they purchase a home. A month after the introduction of the tax, the Greater Vancouver Real Estate Board revealed the number of homes being sold had dropped significantly and prices had stalled since it came into effect.